Round Bunch of 16 Light Pink Mix Roses and Carnations with lots of green fillers in a Nice wrapping. 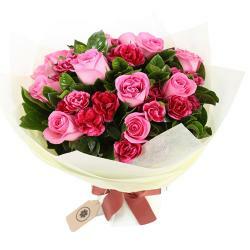 Giftacrossindia.com brings to you this very special bouquet which is perfect for anyone. This Bouquet contains 16 Light Pink Mix Roses and Carnations with lots of green fillers in a Nice wrapping. 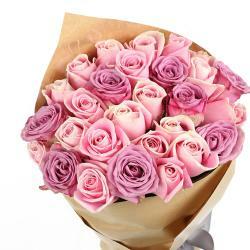 Rose flower has been the symbol love from old times and carnations stands for how much you care for them. 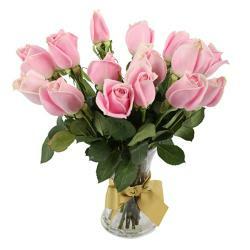 Pink rose portrays true love whereas pink carnations portray appreciation and gratitude. This Bunch of Pink roses and carnations comes together nicely wrapped with ribbon bow on it which makes this bunch look more beautiful. 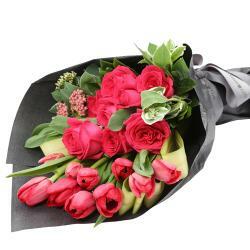 You can send this flower bouquet on special occasion like house warming, baby shower, graduation ceremony, retreat of retirement, get well soon, fathers day, mothers day and many more. 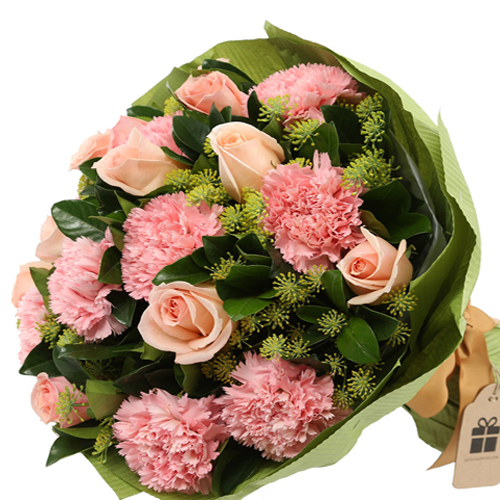 Product Details : Round Bunch of 16 Light Pink Mix Roses and Carnations with lots of green fillers in a Nice wrapping.